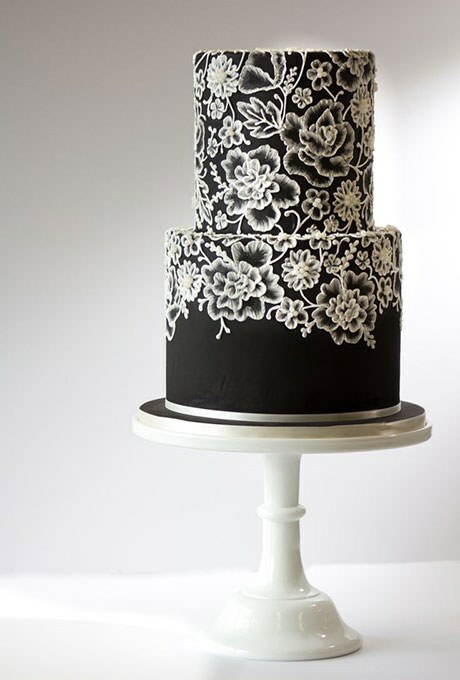 There’s something so elegant about a black and white wedding cake. Black wedding cakes are a modern trend and one that demands a formal setting. Add in a white lace design on the cake and you’ve got a stunning wedding cake. Today’s featured cake would be perfect at a late summer, fall, or winter wedding. It might be a bit dark for a summertime wedding – and you should probably avoid a cake like this with an outdoor wedding! I love the look of the lace on the black icing – it’s so bold yet also so beautiful. You can find this cake here. It was created by Amy Beck Cake Design.